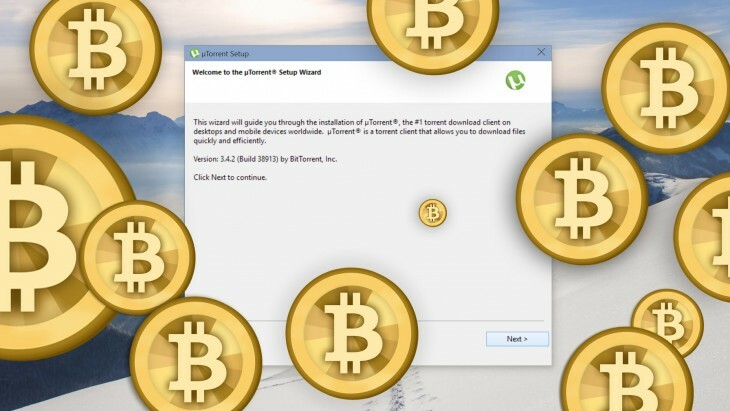 Is uTorrent ‘secretly’ installing BitCoin mining software? Probably not. One of the most popular BitTorrent clients around, uTorrent, has been under fire today after allegedly installing cyptocurrency mining software on its users’ computers without warning. It started when uTorrent community forum member “Groundrunner” noticed increased CPU loads, even while his computer was idle, after installing the most recent update to the software, build 38913. He did some digging, and noticed a piece of software called Epic Scale was now running on his computer. According to Epic Scale’s Website, it solves “math problems for weather prediction, physics simulations, cryptography (including cryptocurrency mining) and more.” The problem-solving and mining are meant to help several charities. Epic Scale says it does not track personal information, and solely uses your CPU when your computer is inactive. Groundrunner said, “there was no information about this during installation” and that he did opt out of BitTorrents’ other offers. Other users chimed in as well, resulting in a cavalcade of complaints. uTorrent’s free client is supported by ads and sponsors; the client has offered other bundled software before, but users were unhappy with the purportedly shady install process this time around. We design our software to ensure that partner software downloads don’t occur without approval by the user. But given your report, we’ve also double-checked this particular offer, and have determined that it cannot be installed without user approval. The representative noted one could delete the software via the Control Panel. A folder would remain in the ProgramData\EpicScale folder, but only contained a user ID and could be deleted. In the last 24 hours we have received less than a dozen inquiries out of several million offers. That should put this issue into perspective. We have reviewed the issue closely and can confirm there is no silent install happening. We are continuing to look at the issue. But this is most likely these users accepted the offer during install. Our engineering team has just confirmed that it is impossible for partner software to be installed without user permission. I also tried uninstalling the software and installing the new build from scratch, but was presented with the same prompt. Granted, the install window does not make it immediately clear that Epic Scale mines for cryptocurrenty (thus adding a CPU load); it just states it “solves math problems”. Nevertheless, this isn’t very different from the way many freeware applications try to have you install sponsor software by making them appear to be part of intended software’s install process. Given some users complained their CPU usage was still higher then normal after uninstalling the software, I brazenly risked my computer’s life by installing the software. Indeed, I noticed a slightly higher CPU load when my computer was inactive, but I was able to delete the software and return to normal performance without any hiccups. When installing the client on OS X, no such offer was made, nor was Epic Scale installed. While uTorrent offers to install sponsor software during initial installations, it doesn’t regularly do so with version updates. That suggests a boring explanation: users didn’t notice the prompt because they simply weren’t expecting it. Unless the company changed something behind the scenes between now and when the original complaints were made, user oversight is the most likely explanation. That said, uTorrent (and others) could make the process more transparent by calling out sponsor offers to make them look less like part of the true installation. Whatever’s going on, it’s good for a common sense reminder: read every page when you install new software.